Photo attached - Apologies for the photo quality - it was taken in a hurry through d/glazing at full zoom about 15 metres away. 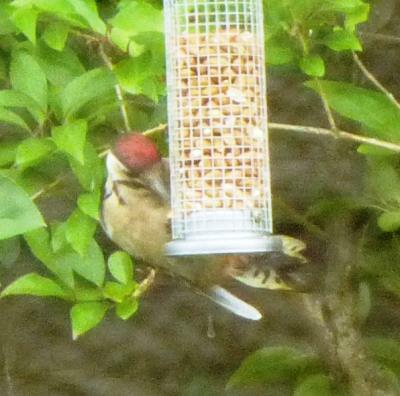 To my untrained eye, my guess is a juvenile Lesser Spotted Woodpecker. I'd be grateful for your opinion. Location was Central Scotland. 160 A Great Spotted Woodpecker is about the size of a Starling whereas a Lesser Spotted is more like the size of a Sparrow. Looking at the size of the bird in your picture (which is not bad considering) I'd say this is a juvenile Great Spotted which has a red cap similar to that of an adult Lesser.